What’s that, Microgaming? 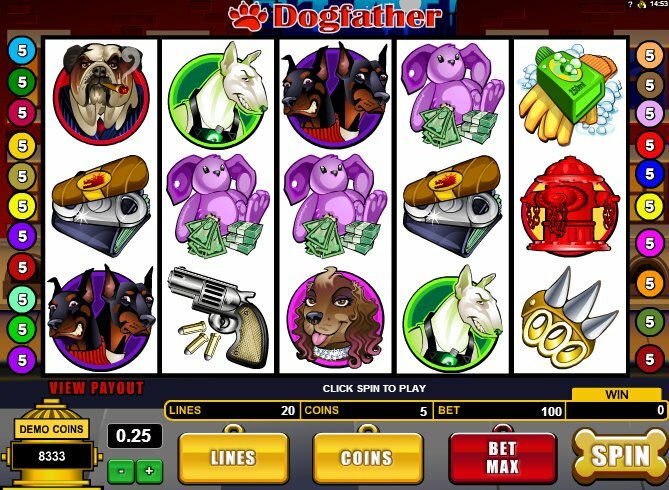 You’ve come out with an online slot called Dogfather? Is it by any chance a play on words on The Godfather but with dogs instead of gangsters? Surely not, it’s just a pun too eas.....oh yes, that’s exactly what you’ve done. Great. Gangsters 'n' Dogs... Say Whaaat?! 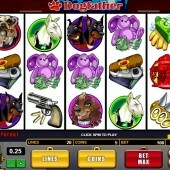 To be fair to the leading online slots developer, the gangster theme has been well recreated in this game: the gangsters are bulldogs (a Dog Corleone if you will), the moll a gorgeous Cocker Spaniel, plus there are knuckledusters in the shape of dog’s claws, doggy toys stuffed with cash, and a bar of soap for that dreaded doggy bath time. Meanwhile, the whole game screen is surrounded by what looks like a New York apartment block and there are some nice doggy touches like the Spin button shaped like a bone. The cigar-chewing mutt Dogfather is the game’s Wild, and he substitutes for all symbols other than the game’s two Scatters. Five ugly mutts across the reels bags you a 13,000-coin jackpot. Meanwhile, the Dogfather’s nemesis, Itchy da Flea, acts as the bonus. Three or more fleas on the reels gets you 13 free spins with a 3x multiplier. That’s an offer you can’t refuse. There’s one more amusing bonus round, triggered here by three or more Fire Hydrant symbols anywhere on the reels. The ‘Mark Your Territory’ Bonus sees a pretty straightforward Pick ‘Em Bonus round play out where you have to choose from a selection of 12 hydrants in order to win cash prizes. Funny... Funny How? Like, Ha Ha Funny?! There’s no doubt there are some funny touches in Dogfather. When forming a winning combo the mob boss starts to read a book called ‘Taking Care of Cats’ and the reels sound like a revolver spinning; but it’s in the bonus rounds that this slot really wins. A generous free spins round which seemed to hit fairly frequently when I played is good enough, but the addition of a second bonus round is great. For similar crime action, there are plenty of comic capers out there: Sheriff Gaming's 3D bank robbery slot, Piggy Bank, or Microgaming's other massively popular banker, Break da Bank Again, are certainly two more slots you should check out which tap into the crime genre.